From the Francigena Way it is possible to access the Amiata region, after crossing the Paglia and climbing the slopes of the mountains of Castell'Azzara. The imposing Sforzesca is the access gate. 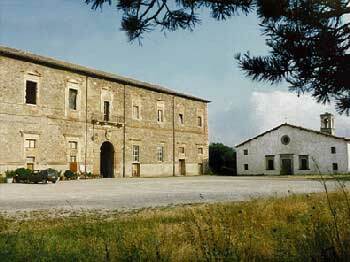 It is a master villa built by Cardinal Alessandro Sforza (1580) who hosted Pope Gregorio XIII° and his court. Surrounded by a boundary wall and originally embellished by a beautiful garden with "water games" , it has a majestic facade (the roof was lowered during a restoration), and in the centre a portal surmounted by the Sforza coat of arms. From the courtyard, two semicircular flights of steps lead to the large internal halls which were originally frescoed with mythological scenes an d landscapes probably of Roman school.